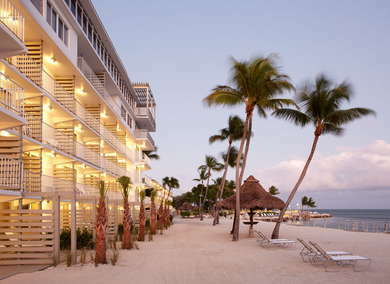 When you imagine the Florida Keys, this is the place that comes to mind, even if you’ve never been to these islands. 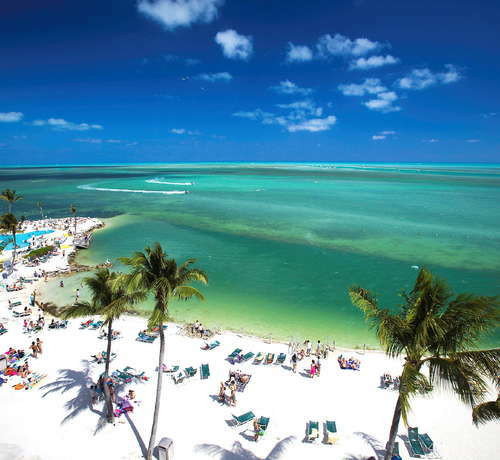 Palm trees, ocean views, charter boats, a tiki bar, water sports, fish sandwiches, icy cold cocktails (namely the iconic Rumrunner)--it’s a Keys experience on steroids, but in a good way. YOU SHOULD KNOW While this used to be the place for partiers when it was simply known as Holiday Isle, over recent years it has transformed into a family oriented, sprawling resort with fantastic onsite amenities. Some salty locals still miss the former raucous atmosphere, but visitors have embraced the welcome change. Is there such a thing as nautical chic? Well, there is now. 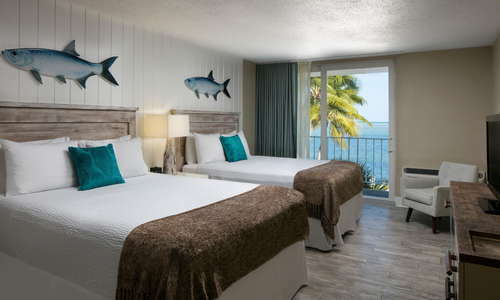 Rooms and suites are newly updated in neutrals with rustic handcrafted furnishings, comfy couches, tiled faux-wood floors, cool accent art, and a pop of blue from those fabulous Atlantic views. Some rooms have kitchenettes. Ask for a ground floor room if you’re active and plan on coming and going a lot. You lose a little privacy with beachgoers right outside, but it’s so easy to just step out and be on the beach, in the midst of it all. White tile, white walls, white shower curtain (or a modern glass door depending on your room), with all the goodies you need, from real Kleenex® to shampoo and lotion. It's functional and clean--no complaints here. YOU SHOULD KNOW Some rooms have the air handler (from the A/C unit) in the ceiling of the bathroom. If you’re sensitive to sound, just keep the door closed; if you love white noise, you’ll sleep like a baby with the door open. Welcoming, detached building with a distinct porte-cochere, and on the inside, the most creative reception desk ever. While it may look like colorful tile, it’s actually built completely out of books--many with a sea-faring theme. Pinterest-worthy, one might say. YOU SHOULD KNOW Don't lose your pool towel card. If you do, it's a $25 charge. Yikes. There are two, but the one you’ll love is the large, free-form shaped one right on the Atlantic with a swim-up bar and a deck full of bright yellow loungers (the kind that leave waffle marks on your rump). YOU SHOULD KNOW Although this resort is non-smoking, watch who you sit by when you’re poolside. Non-smokers will find it annoying to sunbathe and breathe in smoke with the salt air. Lunch at the Raw Bar offers ocean breezes and tasty Mahi Tacos. For dinner, Ciao Hound Italian Kitchen is not only dog-friendly, a dedicated patio and ruff-life menu await your pooch. For you, it’s Tuscany-meets-Florida-Keys with dishes like Yellowtail Snapper Francese or Florida Seared Shrimp with Polenta. If you don’t have a car, take an Uber or a taxi. The Florida Keys Shuttle can take you to and from the airport in Miami or Fort Lauderdale; a jitney bus runs back and forth from Florida City to Marathon several times a day for only $2 but don’t expect a seat as it gets packed with workers who live on the mainland (Homestead/Miami). Hungry and love seafood? The all-you-can-eat seafood buffet at The Sandbar at Whale Harbor (4-minute walk) is a popular choice. The Bayside Gourmet (5-minute drive) has a Grouper Reuben that should win some kind of award. Keep a napkin handy if you’re not a finger-licker. Ziggie & Mad Dog's (4-minute drive) is legendary for its steaks and the history behind it is worth learning. There’s really no reason to leave Postcard Inn as the world-famous Tiki Bar is right onsite. But, if you want a great sunset view (and slow service), try Lorelei’s Cabana Bar (7-minute drive). Locals and fans of the show Bloodline hang out and play pool till 3 a.m. at Whistle Stop Bar and Grill (5-minute drive). The Oceanview Inn & Sports Pub (1-minute drive), known simply as the O.V., is a fun place to catch a game, drink a beer, and have a burger. 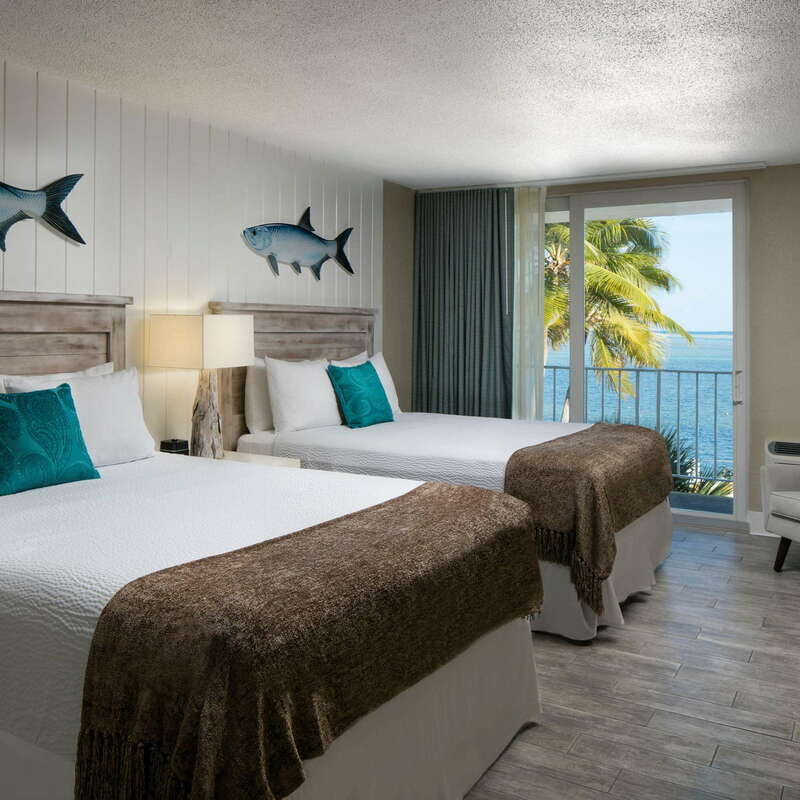 Postcard Inn simply exudes all things Islamorada. Fishing, diving, snorkeling, boating… the list goes on. Yes, they have a resort fee, but it’s nominal ($25) and it includes Wi-Fi, kayaks, paddle boards, peddle boats, bicycles, a water trampoline (a must try! ), and more. At other places, you'll pay much more than that just to rent a kayak for a day. Another huge benefit is the ability to walk right out of your hotel room, grab a Starbucks, and get on a boat. Or, bring your own vessel--they have dock space. Perhaps the best thing about the Postcard Inn Beach Resort & Marina is the laidback attitude. The entire property is a judgment-free zone. No one cares what you’re wearing, or what you do for a living. It’s not that kind of place. Just come as you are--and leave with a tan and a smile.